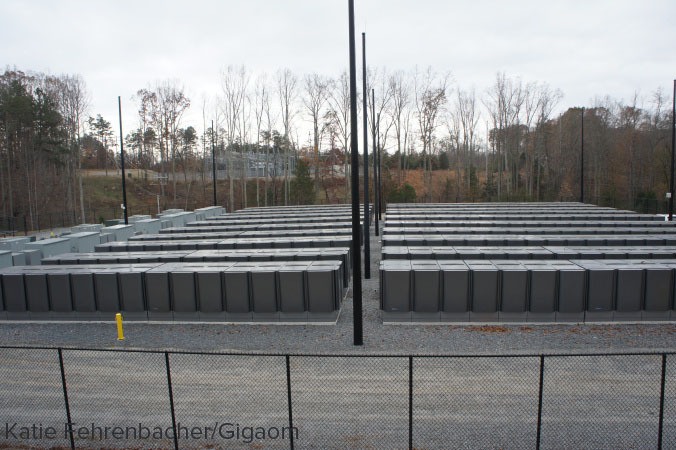 After building large solar power and biogas fuel cell generating facilities at its Maiden, North Carolina data center, Apple is one of the of the largest non-utility clean energy generation companies in the country. As of a report earlier this year, Apple uses 100% renewable energy across all its data centers, plus 75% at its corporate facilities. 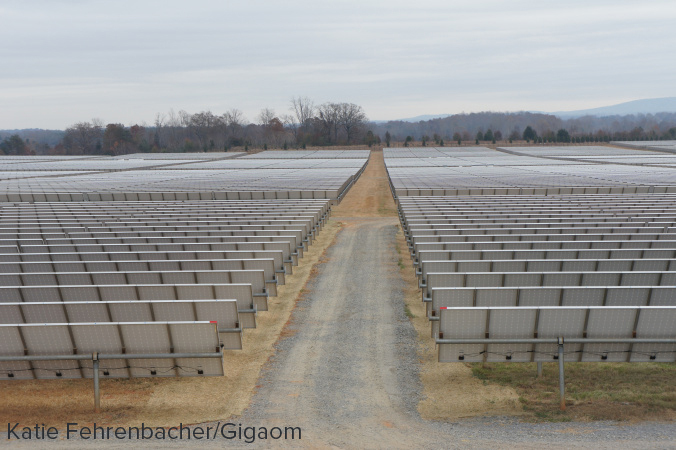 Gigaom's Katie Fehrenbacher went to the facility and has written an extensive article with a number of images of both Apple's two gigantic solar farms, as well as its Bloom Energy biogas fuel cell farm. In total, Apple generates roughly 50 megawatts at peak efficiency -- 40MW across two solar farms, plus another 10MW in fuel cells. With Apple's data center consuming roughly 40 MW of electricity, at times of peak power production the company becomes a net power producer for local utility Duke Energy. Apple appears to be the only major Internet company with its own power generating facilities like these. Apple’s solar panel farms were built and are operated by Bay Area company SunPower. SunPower manufacturers high-efficient solar panels, solar panel trackers and also develops solar panel projects like Apple’s. The solar farm across from the data center has over 50,000 panels on 100 acres, and it took about a year to build the entire thing. Each solar panel on Apple’s farms has a microcontroller on its back, and the panels are attached to long, large trackers (the steel poles in the picture). During the day, the computers automatically and gradually tilt the solar panels so that the face of the panels follow the sun throughout the day. The above picture was taken in the late morning, so by the end of the day, the panels will have completely rotated to face where I was standing. The trackers used are single-axis trackers, which basically means they are less complex and less expensive than more precise dual-axis trackers. Apple works with a company that provides sheep to eat the grass underneath the solar panels, an environmentally friendly alternative to mowing. For its fuel cell facility, Apple uses biogas fuel cells made by Bloom Energy. Biogas is an alternative to natural gas that can be captured from decomposing organic matter like landfills, water treatment facilities and farms. Natural gas is significantly cheaper, but is a nonrenewable fossil fuel. When I was walking around the outside of the fuel cell facility I could also see a couple of people doing maintenance work on some of the fuel cells. I’m not sure what they were doing exactly, but fuel cells need some level of maintenance to keep them provided with the fuel, as well as to replace moving parts like fans. Every few years they also need to have a key part replaced called the stack, which can lead to expensive maintenance costs for the fuel cell operator. Gigaom has much more about the facility in its article, and examines what a number of other tech companies are doing with regards to clean energy as well. Renewable energy is a hot-button issue at the moment with some outside observers like Greenpeace pushing large Internet companies to adopt clean power for their data centers, which consume some 2 percent of the total electricity produced in the United States each year. Apple has worked hard in recent years to improve its public image with regards to the environment, and recently hired former EPA chief Lisa Jackson to head the company's environmental and sustainability efforts. I don't care if it's a tax stunt, publicity stunt, or just for the bottom line, getting renewable energy more popular is a good thing for all of us, and I applaud Apple for doing this. And they call them... iSheep.
. It could be the fact that when analyzed over the entire life of the system - including the cost and environmental impact to create the "green tech", and then at end of lifetime to properly dispose the "green tech", usually the "tech" isn't very "green" at all. Like all new technologies (including oil going back a 100 years ago), it takes significant investment and infrastructure to start it. After technologies mature, the cost naturally comes down. How much resources does it take to build giant rigs to drill for oil, drill for oil, process the oil, build huge oil tankers to transport, build huge pipelines all over the country to distribute it, etc. Now that that whole system in place, it's hardly fair to compare it to a new alternative system that is just starting out. You can bet that big business will not create an alternative unless there is a government pushing them to do so. There are a few exceptions like Apple and Tesla but for the most part, they don't. For examples, look at our Food industries and Oil industries. What they are doing is horrible, yet they have bought out our government and use our taxes to give them benefits? Explain that one to me? Why not give take away their subsidies and give it to alternative renewable power? This will increase the cost of oil, reduce the cost of alternatives. Why not take away subsidies from Monsanto and give it to local food producers. Those people that think organic is too expensive won't think so after fast food goes up in price and healthy organic places come down in price. Oh and as a side benefit, America may just become a little heathier and some of our health care debates may just go away... After all the real problem with our healthcare is that we are sicker than ever....that is why the costs are high. No one wants to fix that, we just keep arguing about the symptom of the problem, not the problem itself. Anyways, I've gone too far off topic. It frustrates me no end how so many now think that things just grow on trees, that they don't require painful gathering from natural resources and extensive, complicated, and often dirty acts of creation. Or that they naturally compost into the ground after it has run its course, and a butterfly sanctuary will magically pop up in its place. One of the beautiful things about fossil fuels is that they are an energy source as well as an energy storage system. Say what you will about the businesses involved, but that's a really solid "green" built-in advantage for those forms of energy. I agree with you that it's not free. But please don't make the argument that a hybrid or electric car is just as dirty as a regular car. Remember that what you see with the alternatives in their starting stages is worst case scenario. As they mature, they get even cleaner and cheaper. Oil on the other hand has little to no room for improvement. I respect apple for this. Why the world is so anti-clean enegy is beyond me. It's not even like we resently knew things like oil were not only finte but bad for our planet, we have known for decades and decades. Why the world is so anti-clean enegy is beyond me. I can either pay something like $100/month now and for the next 40 years while I earn it for cheap non-renewable (but abundant) electricity, or come up with $50,000 now for a "clean" system which I'll have to maintain and replace anyway in a couple decades. Nobody objects to "clean energy" per se. It's the up-front costs, higher overall costs, personal maintenance, and unreliable availability. Electric cars are great, until you have to buy a new battery for $40,000. Solar power is great, until it's too cloudy too long and the buffer gives way and the "non-renewable" grid can't handle the prolonged backup load. Wind is great, until you see a turbine fail and discover nobody wants to fix it. Thorium is fantastically "clean", but nobody wants to even look in the direction of anything construed as "nuclear power". Apple can pull it off because they've got truckloads of cash to pay for these systems up-front (and invest for indefinite self-supplied maintenance costs), large enough centers to make economy of scale work (tens of megawatts), stability & predictability (data centers), location flexibility (build it darn near _anywhere_), and isolation (just need a few people to run the place and a single massive data pipe in/out). When your standard deviations of usage clash with the standard deviations of flexibility, "clean" just doesn't work out yet. In 10-15 states you can lease a solar system for no money down and save money on day 1...the innovation isn't technology it's financing. I don't live in one of those states but for $4,000 I cover 75% of my electricity for the next 20 years...it's not $50,000. It's simple and disturbing at the same time. Big business will do anything to keep their business running strong, including destroying the earth and our health so they can continue to make profits. They will spend $$$ on lobbyists and buying up politicians to ensure that the laws promote their business and hinder any sort of alternative. Finally they will spend $$$ on brain washing people to support de-regulation of our government (telling people that the government takes away our freedom) to get people to vote for politicians that support de-regulation. De-regulation is great for them as it allows them to continue with their unethical practices to make even more money. I ask one question: What are you going to do with all that money when we have no climate, food, water, or earth to live with? To those that are big business supporters and anti government....just know that big business is even worse than big government. They leave you with little to no choice in what you eat, drink, buy and breathe. Unlike big government, they actually have an agenda...to make money at any cost. I applaud Apple for doing this. I applaud companies like Tesla to create our modern electric car. Times will change soon. The "stack" that needs replacing periodically is the fuel cell. I don't know the details of the units from this particular manufacturer, but a fuel cell unit will consist of an actual "stack" of individual fuel cells (a solid or molten membrane of some kind, support framework, and gas transport/diffusion plates and/or media), and then the rest of the ancillary equipment that makes it work--gas plumbing, electrical equipment to convert DC to AC, cooling radiators, etc. But if you're being precise, the stack is the only actual fuel cell. It's the engine in the gasoline generator equivalent, it's just that we've taken to calling generators "engines" in the case of fuel cells. They're usually a large part of the expense of the overall system, but the part that lets the electrochemical reaction work degrades over time, hence the need for replacement (or rebuilding with new electrochemical membranes, in some cases) periodically. How frequently differs wildly depending on the particular technology and how much the cells are used. What's amazing is not that Apple is also using these technologies, it's that Apple uses them exclusively, which exponentially increase the cost. This is like a factory making sure to endlessly reuse all of the water they used.